Randy Denny, vice president of Sales for Xplore Technologies, talked recently at the Esri User Conference held in San Diego about the company’s big news: acquiring Motion Computing in April of 2015. 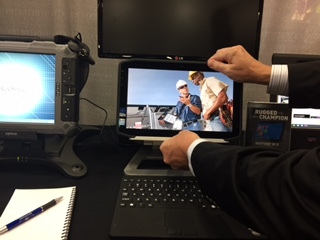 Motion added to Xplore a broader portfolio of solutions in the “rugged category” of tablets. “Now we’ll serve two markets of ultra-rugged devices,” said Denny, “and we have the dominant marketshare.” Denny added that their customers include utilities, construction, public safety and retail. 30% of their business requires some level of customization, such as in-vehicle docks and perhaps including special integration. 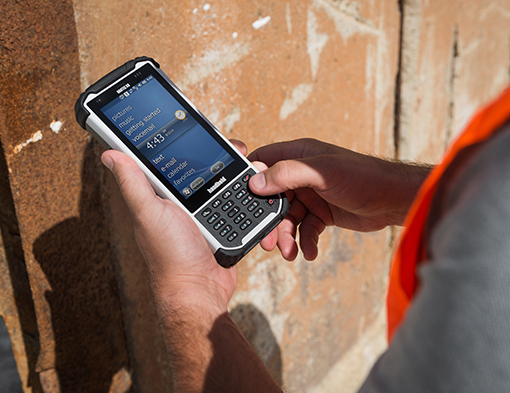 The Bobcat tablet is the latest in Xplore’s family of fully-rugged tablets. Featuring an array of integrated options, and a sophisticated design, the Bobcat is game changing in the world of tablets. With a MIL-STD-810G rating and Windows® 8.1 Pro, the Bobcat can transition from the boardroom to the work site without a hitch. The Motion line of products are “rugged” but not “ultra-rugged” like the Bobcat. They are purpose-built, and they are able to be dropped, survive shock and rain. They have handles and integrated barcode, scanning, GPS, magnetic stripe readers and also goes in a vehicle dock just like the ultra. It also has an office dock. For the Motion line of products, many of their sales are for a device sold as part of a solution, such as in the medical or construction fields. Xplore’s experts can counsel which mobile device and software capabilities are proving mandatory for field technicians working in more remote and more rugged environments – especially O&G, utilities and public safety. Handheld is another company that offers some exciting options, specifically in the handheld ruggedized industry. 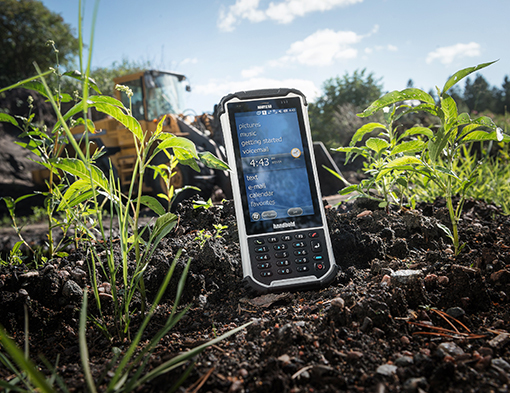 The newly released ergonomic Nautiz X8 delivers a large, brilliant capacitive touchscreen, along with a combination of processing power, connectivity and field ruggedness. 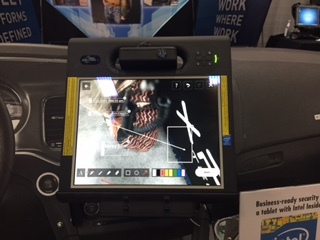 Amy Urban, director of marketing, said that although the Nautiz X8 doubles as a phone, most people will use it as a phone only on the job, not as a regular smartphone device. While the Nautiz X8 is heavier and bigger than an iPhone, it is way more of a workhorse in a relatively small package. This handheld features a high-speed Texas Instruments 4470 dual-core 1.5 GHz processor, 1 GB of RAM, 4 GB of iNAND Flash and a 5200 mAh Li-ion battery that lasts up to 12 hours on a single charge. You have a choice of operating systems Android 4.2.2 or Windows Embedded Handheld 6.5.3. The device has 4.7-inch high-brightness screen the touchscreen can be manipulated using light touch and multi-finger gestures common to smart device users. The Nautiz is IP67-rated and meets stringent MIL-STD-810G U.S. military standards, which means it’s impervious to both dust and water and can survive repeated drops, strong vibrations and operating temperatures ranging from -30 C to 60 C (-22 F to 140 F) and weighs only 490 grams (17.3 ounces). The Nautiz X8 offers a combination of connectivity options and standard features, including a dedicated u-blox GPS receiver, BT 2.0 and 802.11b/g/n WLAN functionality. A built-in 8-megapixel camera with autofocus and an LED flash lets you take pictures easily, and connectivity through GSM/UMTS or CDMA phone data transmission is included. Measure acceleration and orientation with the built-in G-sensor/accelerometer and gyroscope, or navigate with the integrated compass and altimeter. You can also connect additional hardware such as sensors, radios and other add-ons. This entry was posted on Thursday, August 13th, 2015 at 5:12 am. You can follow any responses to this entry through the RSS 2.0 feed. You can leave a response, or trackback from your own site.